Get answers to the most commonly asked questions about Visa SavingsEdge. Is there a fee to enroll in the program? No. Simply enroll your valid Visa Business credit and/or check card on the "Enroll" section of the program website at www.visasavingsedge.com. Everyday Offers are available to you after you receive enrollment confirmation. You'll be eligible to receive automatic discounts as statement credits when you use your enrolled Visa Business card to make qualifying purchases at participating Everyday Offer merchants. Activate Offers must be activated after you enroll. After you receive confirmation that offers are activated, you will be eligible to receive discounts as statement credits when you use your enrolled Visa Business card to make qualifying purchases at participating Activate Offer merchants. Enroll your eligible Visa Business credit and/or check card on the "Enroll" section of the program website at www.visasavingsedge.com. You will be required to read and accept the program Terms and Conditions on your own behalf and on behalf of your business to complete your enrollment. How do I know if my Visa Business Credit and/or Check Card is eligible? When you enter your Visa Business card number during enrollment, Visa will verify your card's eligibility and send confirmation of enrollment. Eligible cards include Visa Business credit cards, Visa Business Platinum credit cards, Visa Business check cards, Visa Business Platinum check cards and Visa Business Signature cards. Can I enroll more than one Visa Business card in Visa SavingsEdge? Yes. You can enroll up to 10 eligible Visa Business cards under a single login if you are the business owner or if you are authorized by the business owner to enroll multiple cards. Only the cardholder who enrolled the cards will receive email communications about the program and can access the password-protected section of the program website. To allow multiple cardholders to receive emails about the program and have account access on the program website, each card must be enrolled separately under a different email address. Then, each enrolled Visa Business card will be treated as a separate account and the discounts received for each qualifying purchase will appear on the account statement for the Visa Business card used to make the qualifying purchase. Why did I receive an error message when I tried to enroll? Be sure you completed all required fields. Also, confirm that you correctly entered your email address and password in the entry and confirmation fields. If you cannot complete your enrollment, please contact Visa Global Customer Care Services at 888-466-9227 for assistance. There may be different Visa SavingsEdge programs, depending on your card/Issuer. A Visa Business card may only be enrolled in one Visa SavingsEdge program at a time. What should I do if I received a message that my card is already enrolled? Your employer or an employee of your business who is authorized to enroll your card may have enrolled your card. Keep in mind, a card number may be enrolled in the program only one time. If another employee has the same card number and enrolled the card number, you cannot enroll the same card number in the program. If you would like more information about enrollment, please contact Visa Global Customer Care at 888-466-9227 for assistance. Someone told me I'm enrolled in Visa SavingsEdge. How was I enrolled? Your employer or an employee of your business who is authorized to enroll your card may have enrolled your card. If so, changes to your profile, access to the program website and receipt of program emails are available only to the authorized cardholder who enrolled your card. To change this, your card must be removed from the program by the cardholder who enrolled your Visa Business card in Visa SavingsEdge. Then, you can re-enroll using your own email address. Why do I need to give my full credit card or check card number? Your full card number is required to confirm eligibility to participate in Visa SavingsEdge, to track your qualifying purchases and to enable Visa to issue your statement credits. Visa will not use this information for any purpose other than to facilitate your participation in the program. How do I get Visa SavingsEdge discounts? 1. 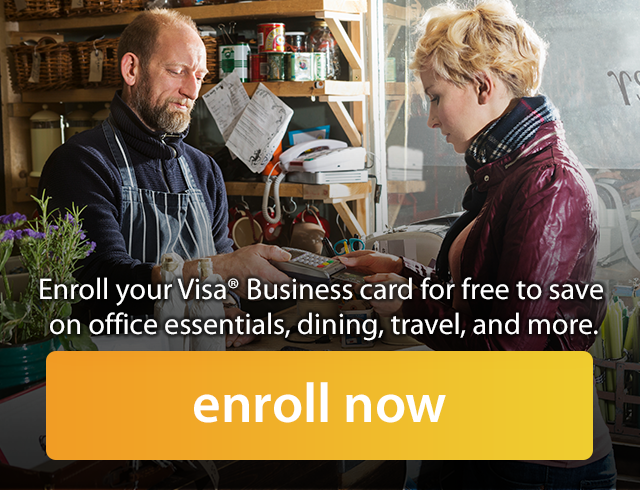 Enroll your eligible Visa Business card(s) online at visasavingsedge.com. 2. Accept the program Terms and Conditions on behalf of yourself and your business. 3. Receive confirmation from Visa that your card(s) is/are enrolled in Visa SavingsEdge. 1. Use your enrolled card at participating merchants with Everyday Offers. 2. The savings amount will be automatically calculated based on the merchant offer terms (please see "Everyday Offers" at visasavingsedge.com for current Everyday offers). 3. Savings will appear as statement credits posted on a future Visa Business Credit and/or Check Card statement. 1. Sign in to Visa SavingsEdge and visit the Activate tab to view the current list of Activate Offers. Please be aware that because these special discounts are offered with limited validity periods, there may be times in which no Activate Offers are available. 2. Click on the Activate Offer(s) you wish to activate, and then click the "activate offer" button associated with each discount. Each Activate Offer must be activated individually. When you see the checkmark, your offer is activated. 3. Make qualifying purchases using your enrolled Visa Business card(s) at the activated merchant(s). There may be additional limits and restrictions associated with a given Activate Offer, including limited validity periods and limitations on the number of transactions eligible to receive discounts. Please review each offer for complete terms and conditions. Activate Offers are added regularly and must be activated on an offer-by-offer basis. Check the Activate tab on www.visasavingsedge.com often for a current list of available discounts. 4. Savings will appear as statement credits posted on a future Visa Business Credit and/or Check Card statement. How do I find specific merchants or items? To search for a specific merchant, item or shopping category, simply enter a keyword in the text-entry field near the top of any page. You can also click on the "Everyday Offers" and "Activate Offers" tabs for a full view of all the merchants where you can get discounts through the Visa SavingsEdge website. How is the amount of the discount calculated? The discount amount is automatically calculated based on the specific merchant offer terms and conditions. For example, if a merchant is offering a 5% discount on all qualifying purchases, then a qualifying purchase of $100 will receive a $5 credit on a future statement. Current offer details are available on the "Everyday Offers" and "Activate Offers" tabs of the program website at www.visasavingsedge.com. Does the discount apply to total purchase price, including sales tax, shipping, etc.? Yes, the discount applies to the total purchase price charged to your enrolled Visa Business card, which may include applicable sales taxes and shipping charges. However, there may be limits and restrictions associated with select merchant discounts. Please review each merchant discount for details. Participating merchants and current offer details are available online at www.visasavingsedge.com. What purchases qualify to receive a discount? What is a qualifying purchase? Qualifying purchases include any signature-based purchase, Internet purchase, phone or mail order purchase, bill payment, contactless purchase (a purchase made by holding your Visa card or other device up to a secure reader instead of swiping your card), or small dollar purchase for which you are not required to sign, made with an enrolled Visa Business Credit and/or Check Card, which is processed or submitted through the Visa U.S.A. Inc. payment system. Do not use a Personal Identification Number (PIN) when paying for your purchases with your enrolled Visa Business Credit and/or Check Card if you want to receive a merchant discount for such purchases. PIN-based purchases, purchases you initiate through identification technology that substitutes for a PIN, payments of existing card balances, balance transfers, cash advances, ATM transactions, convenience checks, Interlink-processed transactions, fees charged by us (for example, annual fees, finance charges, and related service charges, if any apply), payments made for pre-paid and re-loadable cards such as certain gift cards, Visa Buxx, and similar cards, payments made for payment instruments that can readily be converted to cash (for example, traveler's checks, money orders, wire transfers, and similar products or services), or transactions that are not processed or submitted through the Visa U.S.A. Inc. payment system are not qualifying purchases. What if I made purchases before I enrolled my card in Visa SavingsEdge? Only the qualifying purchases you make after you enroll your Visa Business card (and receive confirmation of your enrollment) can qualify for a discount. I made a purchase at a participating merchant and have not received my discount. Why is that? Allow a minimum of two weeks after your qualifying purchase for your credit to post to your account. If you have not received your statement credit after four weeks, contact Visa Global Customer Care Services at 888-466-9227 to investigate. Activate Offers are discount offers that enrolled Visa SavingsEdge cardholders must activate in order to be eligible to receive the associated discounts. Activate Offers are displayed on the Visa SavingsEdge site with a corresponding "activate offer" button to indicate that they must be activated. Check the Activate tab on www.visasavingsedge.com often for a current list of Activate Offers and their respective validity periods. There may be additional limits and restrictions associated with a given Activate Offer. Please review each offer for complete terms and conditions. How do I activate Activate Offers? 1. Enroll your eligible Visa Business card(s) online at www.visasavingsedge.com. For more information about enrollment, see How do I get Visa SavingsEdge discounts? 2. Sign in to Visa SavingsEdge. If you were already enrolled in Visa SavingsEdge but have not signed in since Activate Offers were introduced, you must sign and accept the revised Terms & Conditions. To view the current list of Activate Offers, visit the Activate tab. Please be aware that because these special discounts are offered with limited validity periods, there may be times in which no Activate Offers are available. 3. Click on the Activate Offer(s) you wish to activate, and then click the "activate offer" button associated with each discount. Each Activate Offer must be activated individually. When you see the checkmark, your offer is activated. 4. Make qualifying purchases using your enrolled card(s) at the activated merchant(s). There may be additional limits and restrictions associated with a given Activate Offer, including limited validity periods and limitations on the number of transactions eligible to receive discounts. Please review each offer for complete terms and conditions. You will receive the discount as a statement credit posted on a future Visa Business Credit and/or Check Card statement. Activate Offers are added regularly and must be activated on an offer by offer basis. Check the Activate tab on www.visasavingsedge.com often for a current list of available discounts. Is there a deadline to use Activate Offers? Yes. Because Activate Offers are offered on a limited-time basis, you must activate an Activate Offer and make your qualifying purchase(s) prior to the corresponding offer expiration date, which can be found within each Activate Offer’s offer details. Visit the Activate tab on www.visasavingsedge.com for a current list of available discounts and their respective validity dates. If I have multiple Visa Business cards enrolled, do I need to activate an Activate Offer separately for every one of my enrolled cards? No. Once an offer has been activated by an enrolled Visa Business cardholder, all other enrolled Visa Business cards associated with that account will be eligible to receive the discounts in accordance with the offer's terms and conditions. Please review each individual Activate Offer for restrictions and validity dates. Where can I find Activate Offers? Check the Activate tab on www.visasavingsedge.com for a current list of Activate Offers and their respective validity periods. There may be additional limits and restrictions associated with a given Activate Offer. Please review each offer for complete terms and conditions. Does each Activate Offer have to be activated individually? Yes. In order to save money with Activate Offer discounts, you must proactively activate each individual Activate Offer by clicking the corresponding "activate offer" button. Visit the Activate tab on www.visasavingsedge.com often to ensure you have activated all the current Activate Offers. How will I receive my Visa SavingsEdge discounts? Discounts will be posted as credits to your enrolled Visa Business card account and will appear on a future statement. Look for credits with the following description: "Visa SavingsEdge Discount - [Merchant Name]". When will my discount appear on my Visa Business card statement? Your statement credit will be posted on a future statement. Due to processing time, the credit may not be posted during the same period as the statement on which the related qualifying purchase is posted. I received a credit on my statement that I do not recognize. What is this? Your employer has enrolled your Visa Business card in Visa SavingsEdge, which is a convenient program that provides discounts on qualifying purchases at participating merchants. Your discounts appear as statement credits on your Visa Business card account. For more program details and updates, please visit the program website. I noticed a purchase and credit discrepancy on my Visa Business card statement. What should I do? A discrepancy may occur if any of your purchases were not qualifying purchases. Visa SavingsEdge discounts apply to qualifying purchases only. Also, it may take more than one statement cycle for some of your credits to be posted. If over four weeks have passed since your qualifying purchase was made, contact Visa Global Customer Care Services at 888-466-9227 to investigate. How will I recognize the credit on my statement? When you receive your statement, look for a credit with the following description: "Visa SavingsEdge Discount - [Merchant Name]". Is there a limit to how many statement credits I can earn? There may be limits and restrictions associated with a given merchant discount. Please review each merchant discount for details. Participating merchants and current offer details are available online at www.visasavingsedge.com. How do I cancel my participation in Visa SavingsEdge? To cancel your participation in Visa SavingsEdge, simply sign in to the program website at www.visasavingsedge.com and click on "Manage Cards." Then, click the "delete" option next to each card you wish to remove from the program. If you delete all cards enrolled in Visa SavingsEdge, you will no longer receive discounts on qualifying purchases at participating merchants. However, your username and password will remain valid if you choose to participate again in the future. I'm no longer receiving discounts and I did not cancel my participation. What should I do? It's possible that your Visa Business card number has changed because you reported it lost or stolen. If so, you should enroll your new card number on the program website at www.visasavingsedge.com. If your card number has not changed, please contact Visa Global Customer Care Services at 888-466-9227 to investigate. NOTE: If your account is not in good standing, your participation in the program may be discontinued. When your account returns to good standing, you may begin to receive the discounts again after you re-enroll in the program. Can I re-enroll in Visa SavingsEdge after I have canceled my participation? Yes, you can re-enroll at any time. Once re-enrolled, you will resume receiving Visa SavingsEdge discounts on qualifying purchases at participating merchants. Will I be able to keep my statement credits if I cancel my participation in Visa SavingsEdge? Yes. You will receive statement credits on any qualifying purchases made at participating merchants prior to canceling your participation in Visa SavingsEdge. If your Visa Business card is lost or stolen, first call your issuer at the telephone number on your cardholder agreement or on your account statement. If you do not have your cardholder agreement or an account statement, call (800) VISA-911 to report the loss or theft. What if I receive a replacement Visa Business card with a different card number? If your issuer provides you with a replacement Visa Business card with a different account number, you must enroll your replacement card in Visa SavingsEdge to continue receiving discounts on qualifying purchases at participating merchants. You must also remove the previous card number that was replaced. You can reset your password by clicking on "Forgot password" on the Sign In screen of the program website at www.visasavingsedge.com. After you enter your email address and successfully answer your security question, a temporary password will be sent to your email address. The next time you log in, you will use the temporary password. Then you can reset your password. If you forget the answer to your security question, please contact Visa Global Customer Care Services at 888-466-9227 for assistance. Who do I contact if I have problems enrolling my Visa Business card? Please contact Visa Global Customer Care Services at 888-466-9227 for any questions related to enrolling in Visa SavingsEdge. Who do I contact if I have questions about my discounts and/or statement credits? If you have general questions regarding Program features and/or would like information about Merchant offers, please visit the "Frequently Asked Questions" page and the Merchant Offer Description web page on the Program Website. If you have questions regarding any Qualifying Purchases, Everyday Offers, Activate Offers and/or statement credits related to the Program, please contact Visa Global Customer Care Services at 888-466-9227 for investigation and/or referral to your Visa Business Card issuer, as appropriate. If you have any other questions regarding your Visa Business Card or statement, please contact the customer service representative at your Issuer. The Issuer's contact information may be on the back of the Visa Business Card or in the Card Agreement. Visa may send you periodic email updates to inform you of program changes or updates. You may also receive promotional communications about Visa SavingsEdge, participating merchants, offers and program updates if you opt in to receive them. What if I would like to receive promotional emails about Visa SavingsEdge? When you enroll in Visa SavingsEdge, you can indicate your preference to receive promotional offers. You can change your preferences at any time by logging in to your account on www.visasavingsedge.com and clicking on Preferences. What if I prefer not to receive any emails about Visa SavingsEdge? When you enroll, you can indicate your preference not to receive promotional emails about Visa SavingsEdge. You can change your preferences at any time by logging in to your account on www.visasavingsedge.com and clicking on My Account. How often will I receive program updates? Visa may send you periodic updates to inform you of program changes or updates. When you enroll in Visa SavingsEdge, you can indicate your preference to receive promotional offers. You can change your preferences at any time by logging in to your account on www.visasavingsedge.com and clicking on Preferences. Visa's security strategy encompasses a defense-in-depth approach coupled with strong encryption to protect your personal information. In addition, our policies restrict access to personal information to those employees and service providers who need to know the information in order to provide you this service. We maintain physical, digital and procedural safeguards that comply with applicable privacy and data security laws and regulations. What strategy does Visa take against phishing? Visa employs multiple layers of security to guard against phishing attacks targeting the Visa brand, our customers, products, programs and services. Visa Information Security reviews all suspect communications on a 24x7 and global basis. If research determines an email is fraudulent, we automatically notify an extensive network of Internet security partners to block user access to phish and malware distribution sites. In addition, many of the sites are removed from the Internet and investigations into the threat actors behind these campaigns are initiated. How do I know the emails I receive from Visa SavingsEdge are legitimate? Visa SavingsEdge emails will always include the program name in the sender's name field. We will NEVER ask you for personal information or to verify anything about your Visa Business card account. Requests like these are often scams, and Visa and Visa card issuers take great care to avoid sending any email that may be confused with these types of scams. If you receive an email purporting to be from Visa or any Visa card issuer that you believe is not legitimate, please forward it to phishing@visa.com as an attachment.